My Etsy Spring Wishlist + gift card GIVEAWAY! I like spring. The weather is nice and all the pretty flowers come into bloom... well, not quite yet around where I live, but soon enough. In meantime I've been trawling through Etsy in search of unique springy things to tide me over until everything's green again. 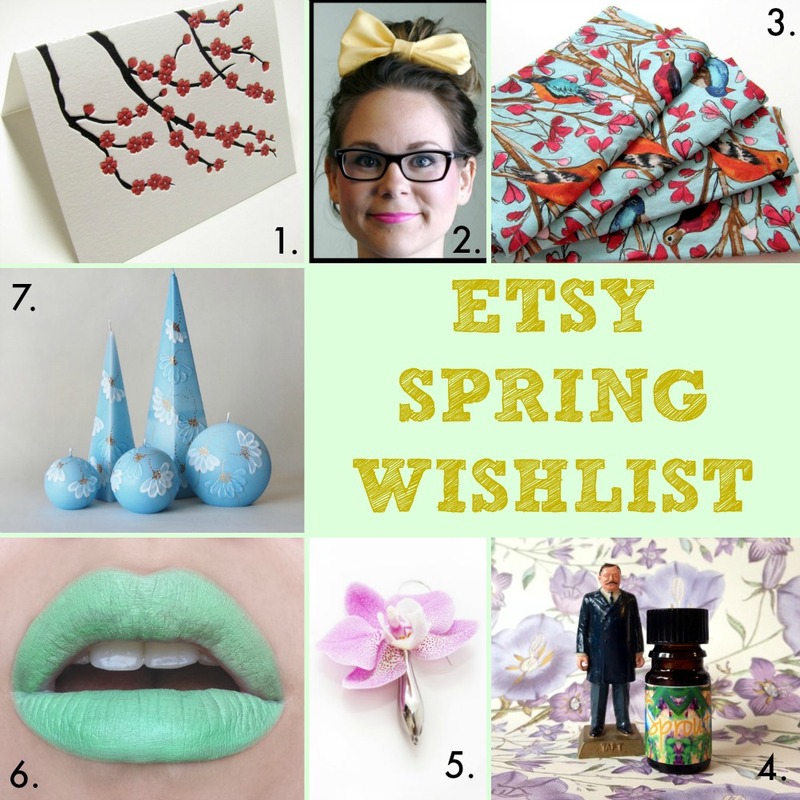 I present to you... my Etsy Spring Wishlist for 2015! All images are the property of their respective sellers. Cherry blossoms are a pretty iconic spring thing, right? It's a bit too early for them to be blooming here, so in the meantime I think I'll admire these beautiful cards by LetterpressLight. Or use them to send a note to a faraway friend. Maybe they'll be blooming by the time it gets there? I like wearing bows in my hair, man. The bigger the better. This pastel bow by vintANGE is simple but captures the feeling of the season nicely—bright, cheerful, giddy. I'm not always good about changing up my home decor for the different seasons. (We may still have Christmas decorations up... shhh.) Life gets in the way of interior decorating sometimes! But cute napkins (with birds, no less) are a quick and easy way to jazz up your kitchen/dining room, and you don't even have to take down the Christmas tree to use them. Which scents remind you the most of spring? This limited edition fragrance oil by OHWTO has notes of wood violets, dewfruit, fresh earth, green leaves, lichen and moss, and delicate alyssum. Sounds deliciously green. I took a stroll through the park yesterday and the ground was still pretty barren and brown, so I could use a little green in my life right now. When you think of spring, what's the first thing you think of? I bet you that flowers will be one of the first things to come to mind for most people, and these vase earrings (!!!) by Fleurings allow you to wear fresh-cut flowers like jewelry. That's one way to ensure that you're wearing unique baubles to every occasion. Pastel pinks and cherry reds are classic lip colors for spring, but in indie-land, pretty much anything goes. There's something strangely appealing about this mint green matte lipstick by Insomnia Cosmetics... would it look good on me? I'm not sure. But it's evocative of spring nonetheless. Last but certainly not least, handmade candles are a great way to spruce up any area. But who need strong scents when all the flowers are in bloom? These amazingly beautiful hand-painted candles by Less Candles aren't scented, but they'll bring a light and cheerful vibe to any room in your home. Now that I've shared my favorite Etsy picks for spring, what are yours? Wait... don't tell me yet. First, enter my giveaway for a chance to win a $25 Etsy gift card to help you get your seasonal shopping started! To enter, use the Rafflecopter widget below. Each entry method may be done once per person except for retweets, which may be done once per day. The full Terms & Conditions can be found in the Rafflecopter widget. The prize is one $25 Etsy Gift Card, which will be sent by e-mail. One winner will be selected at random via the Rafflecopter widget. This giveaway is sponsored by HelloPrettyBird and is not affiliated with Etsy. The giveaway is open internationally except where prohibited by law. Please bear in mind that the gift card will be sent in USD—if you live outside the United States you will need to change your default Etsy browsing currency to USD in order to use the gift card. It's not hard to do, I'm just letting you know! The giveaway ends at 11:59PM EST on April 20th, 2015. The winner will be contacted via e-mail and will 48 hours to respond in order to claim their prize, so make sure you log into the Rafflecopter widget with a valid e-mail address that you check frequently. What do you think of my Etsy spring wishlist? Which of these items feels the most spring-like to you? These ETSY Wishlist posts are fast becoming my favorites from you. Giveaway or not, I love being pointed in the right direction about new products/stores, ETSY can definately be overwhelming. Haha yes! That mint color definitely works as a nail polish. I'm still not sure if I'd wear it in lipstick form, but I really appreciate that it exists. Haha! Unfortunately, I doubt that President Taft comes with it. Maybe his endorsement is enough though. Aww thanks! And I definitely agree. Etsy has lots of treasures, but also a lot of crap if we're being honest. Haha, edgy, yes. Maybe I could get a matching mint green hair bow and wear it at the same time as the lipstick? That would be special! We never decorated for Halloween, but if we had, I'm sure there would still be Halloween stuff around too, lol. I just looked up The Rogue and the Wolf! I dig the skull jewelry. It's not exactly springy, but it's definitely cool. Looks like they are having a spring sale though? I don't know when the Spring sale ends but I hop it's long enough for my money to be freed up from PayPal - selling on ebay is great extra income but you have to wait forever for your funds to be released. I'm hoping to get a couple bronze midi rings. I hope you had a wonderful Easter! Thanks, I hope you did too! This is such cute stuff! I really like the hair bow. I love that bows are in right now. Me too! I love wearing bows in my hair. VASE EARRINGS?! Amazing! That lipstick is calling my name too! Yes! Vase earrings are amazing. I used to work at a florist years ago and we would sometimes stick the flower stems in these little plastic water tube things to preserve them, but somehow I never thought to stick one to my ear, lol. I have issues, whenever I try to fill my facebook name in on the rafflecopter (Nicole Graham) it reverts to nicolthepickle when I click submit. Very nice stuff. I love the candles. I love the napkins you picked out-so pretty!